I posted a couple of weeks ago that I’d entered two pieces in the Falls Church Arts Plein Aire Contest. Neither of them won prizes, but I learned today that my painting of the Mad Fox Brewing Company (our local brew pub) sold on the morning the show opened and was the first painting in the show to be sold! That’s kind of like winning, isn’t it? It’s not my favorite painting, but part of that is because I’m partial to landscapes more than cityscapes. Still, art speaks to people in different ways. I’m thrilled that this painting meant enough to someone for them to purchase it. Apparently others inquired as well, which is very flattering. I really enjoyed painting it. It has a story because it got rained on the first day and I had to repaint most of it. I was self-conscious at first but people were curious and very nice. I guess I’ll have to do it again and see if I can repeat my success. This is a really big step for me. I’ve been validated. Can I quit my day job yet? 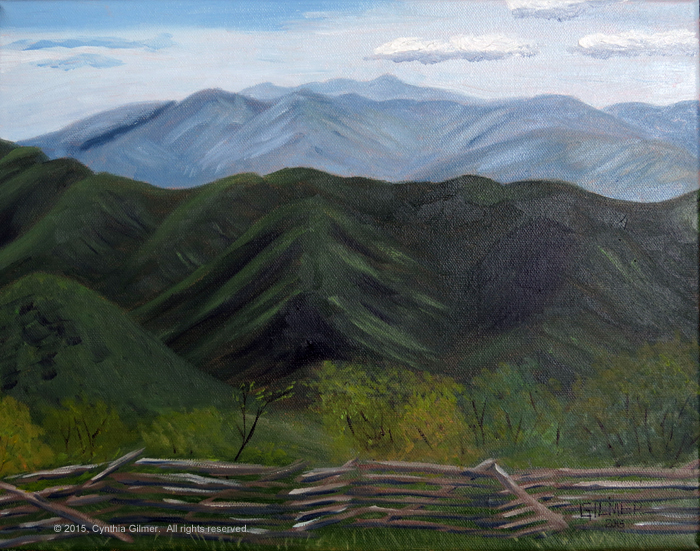 Several weeks back I wrote a post about the wonderful experience I had plein aire painting at the Devil’s Knob overlook when the group showed up to rehearse for a wedding that was scheduled for the next day. I promised to post a picture of the finished painting. I did the sky and the mountains on location, but was forced to leave before it rained. I finished the foreground, including the fence and trees in studio. I’m happy with the result. More important it is an experience I will remember! 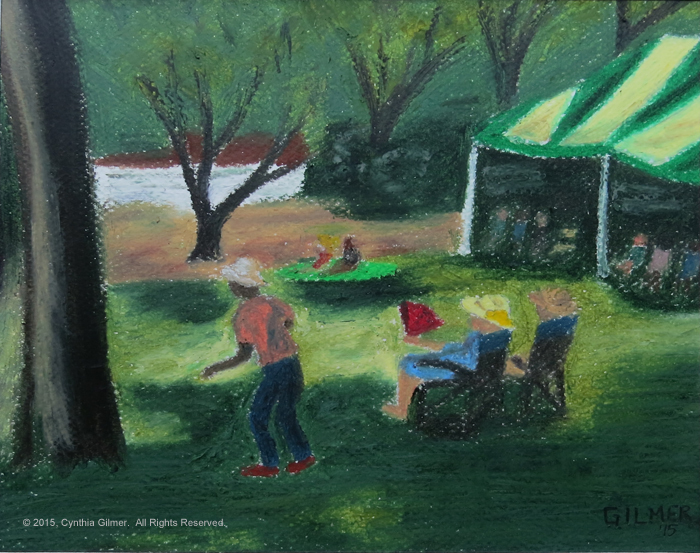 Every year Falls Church Arts has a plein aire painting competition in the Spring. To be eligible, paintings must be done between April and June and they must be done outside on location, within the City of Falls Church. Artists register to participate and then they must have their supports (canvas, paper, etc.) stamped by Falls Church Arts before painting. Last year I registered, but I didn’t actually put anything in the show. The only plein aire painting I’d done prior to that time was in an “Art in the Parks” class I took with Jennifer Schoechle about ten years earlier. I did one painting of my friend Susan’s house. I was very self-conscious about painting outside among crowds, so I decided Susan’s front yard, which was protected by a hedge, provided the privacy I needed. The painting did not meet my expectations, so I didn’t enter it. This year I registered again. The one big thing that’s changed since last year is that I’ve gotten over some of my self-consciousness. I don’t really care if people watch me paint now. That’s a big step. As a result, I’m starting to do a little more plein aire painting. That said, there are many other challenges. Falls Church is pretty urban. I’m much better at painting nature thank I am man-made objects. I have challenges with straight edges, corners, perspective, etc. Nature is much more forgiving when it comes to those things. Urban scenes also have people in them. Learning to draw people takes a lot of practice. I took a portrait painting class more than ten years ago, also from Jennifer Schoechle, but I haven’t drawn people since. This year I have two paintings that I’m going to actually enter. As it turns out, I don’t really like either one much. They are very primitive (that’s my nice way of saying that the perspective is bad and the people are not very good). I’m entering them anyway because I want to support my art community with my participation. 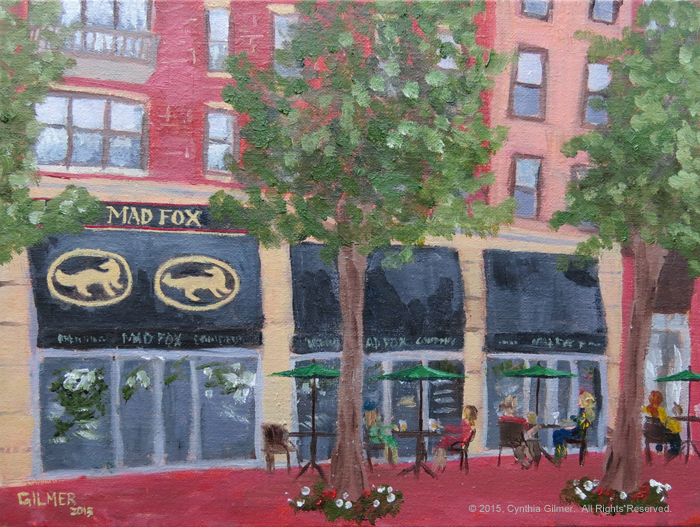 The first painting, is of the Mad Fox Brewing Company, a local watering hole on the first floor of a retail/residential building. I wrote about this a few weeks ago, because in my first session I got rained on which took quite a toll on the painting. I got a chance to do a second session where I first repaired the damage and then I finished the work. This painting is 12 x 9 oil on canvas board. The second painting I did yesterday at the Tinner Hill Blues Festival. This festival is held every year in Cherry Hill Park in Falls Church. I started the painting early before there were too many people there. I did try to capture this one guy who shows up and dances every year, along with a few other people sitting around watching the early acts. I did this in oil pastel, which is not a medium I have much practice working in. It was a good choice on this occasion because it is not liquid, making it easier to transport and use in a crowded environment. This piece is 10 x 8. These will both be on display with the show at the Falls Church City Hall and then at Artspace. I’ve seen a few of the other pieces and they are lovely. Next year I expect to be even better at this. Now if we only had some mountains in Falls Church.